The annual traditional festival held in Doolin falling on the last full weekend in February is a remembrance ceremony to the Russell family, Micho Packie and Gussie Russell, the world-famous traditional musicians. The festival began in 1995 as a remembrance ceremony to Micho Russell, one of Ireland's best known and loved traditional musicians, who died in 1994. In 2006 the festival was renamed the Russell Memorial Weekend in memory of the three Russell brothers, Micho, Gussie, and Packie and their two sisters, Bridie and Mary Kate. The weekend festival is now firmly established on the traditional festival calendar as one of the earliest festivals of the year. It also hosts some of the best of traditional entertainment and attracts musicians from around the country. The theme throughout the weekend is one of celebration as the new and vibrant music talents attract the growing audience for traditional music. There is also a hint of nostalgia for visitors and locals alike as they revisit and relive the "heyday" of Doolin in the 1960s and 1970s in music sessions taking place in the public houses and hotels. The highlight of the festival is the concert on Saturday afternoon. The concert has a unique and spontaneous atmosphere, which often includes surprise guest appearances. Recent performers include: Liam Óg O Flynn, Joe Burke, Seamus Tansey, Bobby Gardiner, John Carty, Kieran Hanrahan, Coir Cúil Aodh, Tony McMahon, Christy Barry, and many more. On Sunday, an annual anniversary mass is held at Doolin Church in memory of the many musicians who have passed away, followed by a wreath-laying service at the Russell grave in Doolin Cemetery. 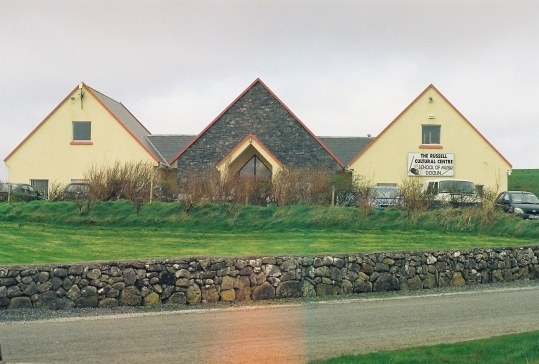 Events throughout the weekend take place in the Russell Cultural Centre (pictured below), a facility with community hall and meeting rooms completed in 2000. Festival exhibitions, lectures, poetry readings, stage performances, workshops, and receptions are generally facilitated here. The Russell Memorial Weekend Committee acknowledges the financial support of Guinness and Clare Arts Office in making the 21st Russell Memorial Weekend possible.